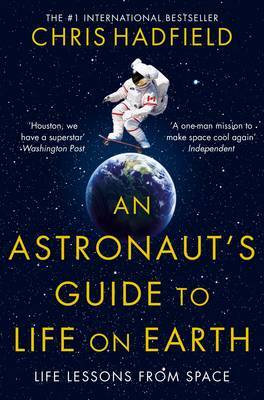 I’m reading Chris Hadfield’s book An Astronaut’s Guide to Life on Earth at the moment and I can see why it became an international bestseller. He’s an immensely impressive and accomplished human being, one who has (quite literally) been places and done things that the vast majority never could, but he writes in such a gently humorous and self-aware way that it utterly charms you. In a chapter on success he talks about attitude and how it’s vital that you enjoy (or, at least, find interesting) the on-earth aspects of being an astronaut. To become an astronaut takes incredible focus, sacrifice and hard work and, even if you are one of the very few chosen, there is no guarantee of making it into space. The life of an astronaut is endless study, physical and mental training, and performing support and research roles on earth. The point he makes is that you have to be okay with that. He consciously found the interest and satisfaction with every part of the process, so that if he didn’t get into space he would still have had a happy and successful working life. As always, I can’t help relating *everything* to writing, and this reminded me of the journey to publication (and beyond). You spend years training (reading, writing, learning the craft) before you finish a decent, readable book, and then there is absolutely no guarantee that you will get an agent or a publishing contract. Yes, you can put stuff ‘out there’ yourself (especially these days with the advent of digital publishing) but there is no guarantee that you will find readers or become ‘successful’ (whatever that means). Essentially, you have to love the practice. The writing and rewriting and editing. You have to love thinking up stories and sitting alone to write them down. You have to find joy in the day-to-day process because, ultimately, that’s all you have. Even if you strike gold and become one of the super-successful authors and get invited on breakfast television and to literary festivals and have a fancy-pants book launch, those things still only take up a very small amount of time. Overall, your life remains the same; sitting on your own and putting words on the page. Reading about the insanely vigorous and difficult (and life-threatening) work of people in the space programme, I’m just deeply grateful that my dream job is writing and not being an astronaut. Today, after all, I just have to drink tea and type some words. When you consider that a typical day for an astronaut might include putting a fighter jet through emergency manoeuvres, weightlessness training in a deep pool, or survival training in the mountains, that’s really not so hard… Perspective: Marvellous thing. Sarah….well said! I have always enjoyed the process of writing, and enjoy editing even more. The task of looking for a place for an article, a novel, any of that, I find to be the least agreeable part of writing. I have had inspirational articles published, and that was exciting. They sold themselves because I wrote from my heart. Thank you, Judy! I absolutely agree with you that the key to success in writing (and publishing) is writing from the heart. Well done on your articles! Thanks! There’s nothing like the high you get when someone thinks enough of your work to publish it..as you well know! N.B. Moderator has just sent this back as a ‘Duplicate comment’ – and that I’d already said this, which is rather strange as I’ve just composed it, and if this is the case, then why hasn’t it appeared on your blog?